Onyx, a form of marble, is a truly stunning stone known for its incredibly rich colors and luminosity, but etching, wear patterns, scratches, dullness and other problems can really take a toll on the appearance of onyx. If this is true of your onyx, don’t replace it. Have it restored to like new! The highly trained, professional technicians at Tennessee Stone Care provide expert onyx cleaning, polishing, sealing, repair, restoration, and maintenance services for onyx floors and surfaces in both residential and commercial properties. Whatever your needs may be, we can restore the head-turning, translucent beauty of your onyx so it looks just as good or better than when it was installed. Keep reading to learn more about what we can do to resolve your particular onyx problem. Are your onyx surfaces too dull or too shiny? Call Tennessee Stone Care and specify the finish you need. If you have a new floor with some tiles that look more glossy than others – let us even out the finish for you. Whether you have or are seeking to acquire a gloss, semi-gloss or matte finish, our knowledgeable technicians can deliver a beautifully restored finish for all your onyx surfaces. When tiles are set unevenly, this is called lippage. Aside from detracting from the beauty of your installation, lippage can create a trip and fall hazard. You need not replace the entire floor, because our expert technicians can grind the stone to a uniform, flat surface. The honed or polished end result will look as good or better than when the floor was first installed. A calcium-based stone, onyx reacts to acids found in lemon, wine, cleaners, and other substances, which can result in etch marks on the stone’s surface. Our expert technicians can hone your onyx countertops, furniture tops, walls, floors and other surfaces to eliminate etching, wear patterns, scratches, dullness and other problems. They can also achieve a honed or soft matte finish that is warm, inviting, and velvety smooth. Tennessee Stone Care can also polish your onyx using the appropriate diamonds or polishing powders to provide a beautiful, glass-like polish. Once your surfaces are restored to their original beauty, we highly recommend having your onyx sealed to enhance its stain resistance. Most stones (unless resined) are naturally porous. If left unsealed, there’s always a risk of spilling a colored or reactive liquid, resulting in stone discoloration. While most stains can be removed, onyx stain removal can be time consuming, expensive and often frustrating. Sealing your onyx surfaces represents an inexpensive, preventative measure against stain damage. Tennessee Stone Care is experienced in removing stains and discolorations from your onyx surfaces. Whether you are seeking guidance for do-it-yourself stain removal or would prefer to have us remove the discolorations for you, rest assured the original finish of your stone can be most likely be restored. 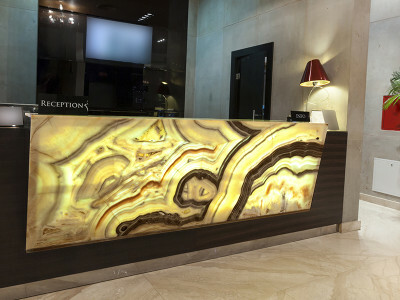 Tennessee Stone Care provides both residential and commercial onyx maintenance services. In addition, we can recommend and implement a maintenance program tailored to the placement, traffic, and usage of your onyx surfaces. For a free estimate on any of our onyx restoration services throughout Tennessee, including Nashville, Memphis, Knoxville, Murfreesboro, Clarksville, and Chattanooga and surrounding areas, send us a message or give us a call at (615) 351-4676.